YESTERDAY, in between writing and cooking assignments, I spent some time working in the Herb Garden, with Lily the Beagle at my side. Would you like to visit us in this tiny but productive potager? 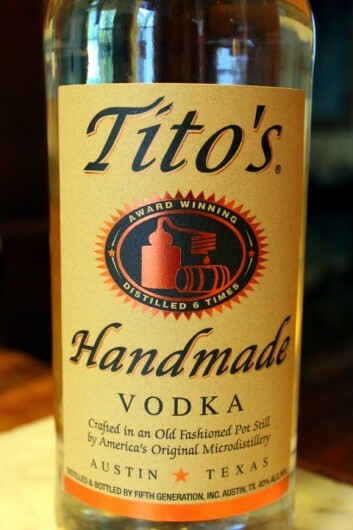 Since you are taking the time to visit, the least I can do is offer you something to drink. And mixed it with a sensible amount of this. The center urn is planted with violet-blue Calibrachoa ‘Callie’. I love these “million bells,” because they do not require dead-heading. And unlike its petunia cousin, Calibrachoa does not faint in the heat and humidity of our Hudson Valley summers. The first bed is my all-you-can-eat salad bar. 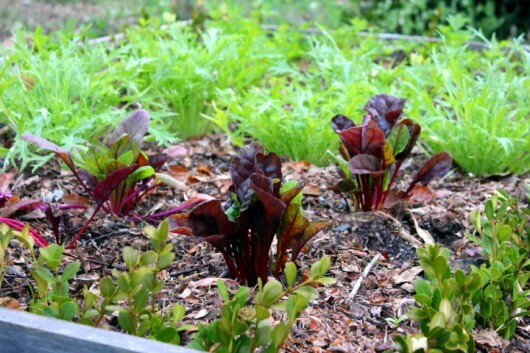 Its planted with green lettuce, red lettuce, and ‘Bloomsdale Longstanding’ spinach. 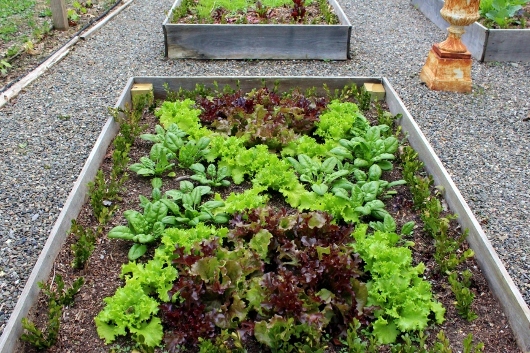 Another bed contains Swiss chard, ‘Mizuna’ lettuce (delicious — please taste a leaf), and “Italian” (flat-leaved) parsley. 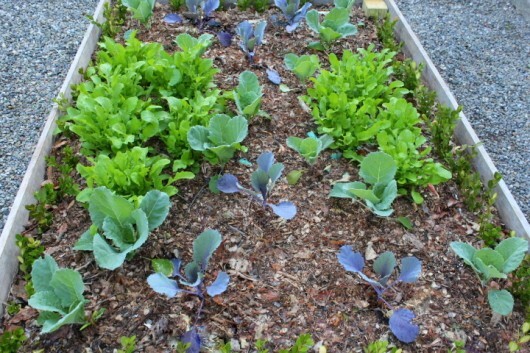 Arugula and red and green cabbage reside in the third bed. In the fourth bed is the big clump of common chives I use for this fabulous pesto. Planted in a pair of demi-lunes around the chives, but yet to emerge, are haricot vert (slender green beans). 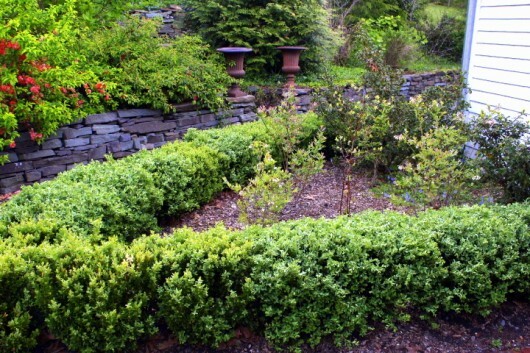 In case you’re wondering, all four beds are edged with boxwood cuttings. Once these have produced roots (which should be any day now, because I inserted them about 6 weeks ago), they will become little evergreen shrubs that provide winter interest for thine and mine eyes. If you peer over the north fence, you’ll see my little blueberry patch. It, too, is framed with boxwood that I produced from cut stems. 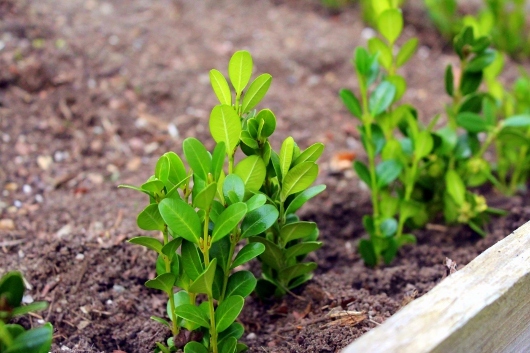 Wanna propagate your own boxwood? The easy directions. Back to the Herb Garden. In the picture above, please note the horrid ground on the left side of the fence. Now you know why I have raised beds. This weedy, rocky terrain at the base of a sharp slope always looks unkempt. Grass will not grow there. To solve the weed problem, I retrieved my stash of newspaper, and laid it out as a 2-foot-wide path. I positioned the edge of the pages flush against the fence. My local garden center did not have bagged wood chips. Would you like to know what they offered? They offered dyed, red cedar mulch. And dyed, jet-black cedar mulch. Finally I spotted some bags of natural (read: not-dyed) shredded mulch. It wasn’t what I’d hoped for, but a desperate decorator must compromise. I purchased 4 bags. While Lily patrolled for vicious squirrels, I spread the shredded matter over The New York Times. 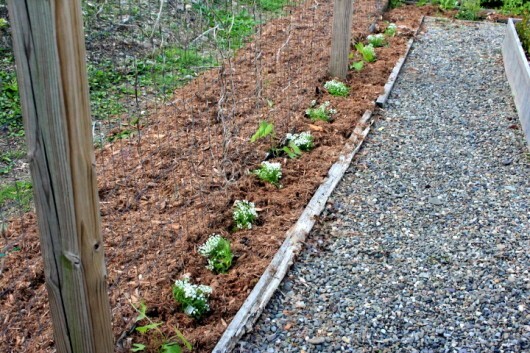 I also applied the mulch to the narrow border inside the fence, and then planted the border with alyssum. 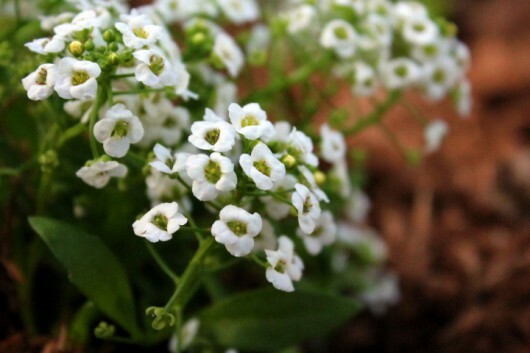 Alyssum is a hardy annual with a strong, honeyed scent. while Mr. Morning Glory, planted a week ago, will turn the fence into a living green wall. 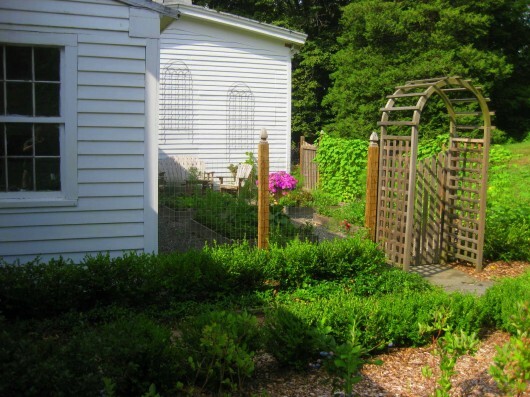 In this photo from July, 2010, you can see the morning glory-cloaked fence. 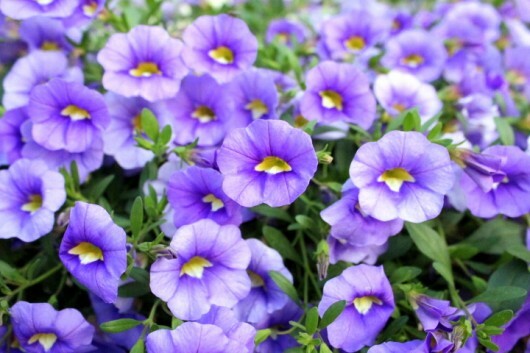 I love the vine’s foliage as much as its ‘Heavenly Blue’ flowers. And that’s all for today! Thank you for visiting my humble Herb Garden. I know that Lily the Beagle enjoyed your company, too. 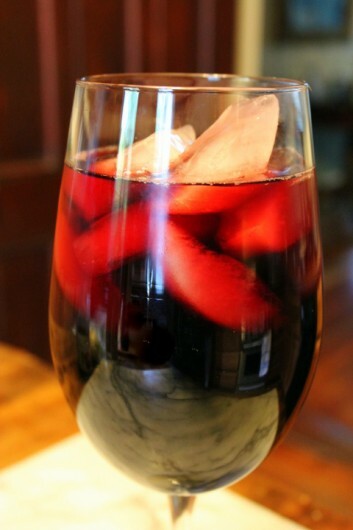 Yes, you may have another Pomegranate-Vodka Cocktail. But only if you promise to tell me, in the comments field below, what’s happening in your world. As always, your words are the sunshine of my day. I’m with you on the dyed mulch. Don’t like it and am having trouble finding the regular untreated cedar or cypress mulch. I can’t believe how much further along your plants are than mine, I live in WV. You have a beautiful garden! how do you keep deer, rabbits and other little friends from helping themselves to your harvest? This was a lovely tour, thank you. In my corner of the world….. well I am going to plant some Moringa seed in a planter as soon as they get here. My Basil ,Mint ,Parsley and Rosemary are coming along nicely to. Loved the tour,, and enjoyed the cocktail as well. I miss my raised bed herb garden so much ,but with back issues I have gone the easy route ,and garden from potted herbs on my deck now . Had to cut back on all the different ones I use to grow , but make good use of those I can. There is nothing more relaxing than a early morning cup of coffee on my deck listening to the morning songs of the birds, snipping , and harvesting my little gems before the heat of the day gets to them. I made little mini green houses from the large dome plastic containers whole roasted chicken comes in from Sam’s Club, punched holes in the bottom for drainage, and sewed my seed into seed starter mix. Worked out beautifully , and I will never throw out another one of those containers. Transplanted mini red, green ,and yellow bell peppers this morning, along with my little cherry tomatoes. Basil and parsley will have new homes tomorrow. Will see how they do as container grown. Love, love your blog ,and look forward to our next tour. You are such a joy to follow, and the perfect host. I wish I were as dedicated as you. My world is full of weeds. It has been hard for me to get a handle on weeds and planting this year. I dream through your website!!! Love it!!!! I love your garden tours. Thanks! We’ve been using your newspaper [cardboard] mulching technique in the perennial beds. Works beautifully! Most of my veg garden is in already – just the pumpkins and sweet potatoes left. I’m always working on another structural project, too. This year it’s to install some drainage tile and tons [literally] of gravel on two sides of the studio. We have a lot of clay, so we dig a lot of drainage and install gravel paths. Hard work, but pretty in the end. I love the calibrachea. That is now on my wish list. I love the pattern in your salad bar. I still have my wintersown veggies and tender house started veggies to plant. Some of the wintersown perennials are just now coming up. I am so sorry that your town no longer provides free mulch. I sure hope our town continues to offer it since I’m in need of several more bins of it! I just got 5 blueberry bushes, 5 elderberries, 5 red leaf roses and 2 packs of periwinkle at half price from our county soil and water conservation district. So I now have much work to do! Thank you for the lovely tours and great ideas! You’re herb garden looks like it is going strong. Looks great. I can’t believe Memorial Day is so close. Still way behind our usual schedule in WI. Finally my winter-sown seeds have sprouted, except for zinnia and hollyhock. I planted some replacement seeds last week. I found that in my winter-sowing I forgot to plant my parsley, my most used herb. I planted the seeds directly and am awaiting those sprouts. Already enjoying arugula, spinach, chives, and a bit of kale. Glad you reminded me of the chive pesto. Tomatoes , peppers, and eggplant seedlings are looking good even if they are well behind. Finally put in strawberries. I know I won’t get any this year but will be so glad I did it next spring. So curious as to what this growing season has in store for us. I’m going to try that drink tonight! We went on vacation to Hawaii for the week and enjoyed all the weird, but amazing tropical flora. When we got home to Snoqualmie, WA everything was in bloom! Golden raintree, delphiniums, irises and rhodies all greeted me! And my black hollyhocks are loaded with blossoms for the first time. Curious if you know of a good rust-resistant variety of hollyhock to try? Mine suffer horribly from that fungus. I’m not a gardener, yet, but please explain to me how long for the newspaper on the ground. Do you remove them then spread mulch? We’re battling weeds big time. Can’t keep up and hate it when my husband uses Roundup chemicals in the yard to kill weeds and ants. We vote when we purchase. Thanks to you, Kevin, for shunning the dyed stuff. Thank you for the tour Kevin…I just want to say I love your spirit and sense of humor! You make my day! Your story about the newspaper reminded me of our funny experience this past year. I used your idea and laid paper (indeed, the New York Times, even out here in Utah) around our rose bed and covered with mulch. It looked so pretty for weeks but by summer’s end the weeds were winning again and coming up through the mulch. (Obviously I didn’t use a thick-enough layer of paper!) However, the “funny” part was that early this spring I realized it was a good thing that I hadn’t used enough paper since that bed was absolutely solid with grape hyacinth — which I’d totally forgotten was planted there (we’d inherited it there, not planted it ourselves) and we would have missed out on had I put *enough* paper down. So, a classic case of all’s well that ends well. Guess I might just try another layer of mulch this year to try to keep the weeds (including our ever-present and totally invasive sweet-pea that someone previously planted in a fit of insanity and is now EVERYWHERE) down to a dull roar. I’ve been meaning to share this song performed by Pink Martini. It sounds like it is Lily the Beagle’s theme song! Be sure and have a pink martini when you listen to it. I enjoy your tours so much. Had to pass on the PVC but loved the pomegranate on the rocks! You definitely have a green thumb; I never have success with cuttings. My garden is about bloomed out right now. Will have to wait for some of my summer flowers to pop-up in the next few weeks. Have a wonderful Memorial weekend! Sheree – Lily’s theme song indeed. What a great tune! BEAUTIFUL, job well done 😉 I used cardboard with straw, and in another area cypress mulch, they both have worked out great. Thanks for sharing all you do ! Your garden is so beautiful! Do you have any problems with rabbits in the garden? They seem to eat everything I plant. UGH!!! Also, I just heard about a new disease that wrecks havoc on boxwoods. called Bow blight. Have you had any problems with this? Thank you for the tour, as always. Do the herbs get enough sun in that position? I would think it would be too dark, the sun being blocked. What direction does the garden face? I just woke up today to find my five spirea covered with red aphids. Same as last year this time. Last year I sprayed with horticultural oil and I saw no sign of them all summer and fall. But they are back strong. I read I could knock them off with a jet of water too. Do you have a way to stop them from overwintering and coming back? It’s so nice to finally be able to enjoy springtime weather and spend time in my perennial shade garden. Your gardens look wonderful. Thanks for sharing your photos! Currently puzzling out what to plant to attract beneficial insects this year. Over the winter the neighbors installed a solid fence so the area is now no longer sunny. Think I’ll get on that right now. How would bagged shavings for horse stalls, usually available at a feed store or Tractor Supply here in Louisiana, work for mulch? Most of it is pine so it might change the soil balance but it is dye free. I just found this site a short time ago and find it a nice relaxing visit during a busy day. Kevin, you might try contacting local arborists and tree trimming companies. I’ve managed to get 3-4 full truckloads of wood chips from groups doing work in my neighborhood… for free of course! They’d have to pay to take to dump/green waste site, plus time and gas, and have been very willing to drop off in my back yard. Some drawbacks as to contents (palm is not good), but I usually see what they are trimming and judge accordingly. A bit hit and miss which is why I suggested contacting the companies directly and offering to accept chipped loads. Anyway to all, “un grand bonjour de la France” and enjoy gardening ! If you ever figure out a way to get RID of ‘vicious’ squirrels… please share. Really don’t care for the little tree rats. Kevin, I keep telling myself “I envy no one” but Dear-heart, your gardens, recipes and awesome renovations to your home sure push the envelope! Not really sure if it’s the results of your efforts or the fact that you do all these things yourself and still are a wonderfully friendly person that has me saying Oh how i wish………. Watch out for those morning glories: here in the Northwest, they spread like wildfire all over the garden. The previous owner of my house (on Vashon Island, near Seattle) planted MG and we are battling to remove them, along with the buttercups that also spread voraciously. I love to read your weekly messages. Hello! That PVC was just what I needed. Just came in the house after working in my herb garden. It’s tiny compared to yours. My calendulas have come back (first time that’s happened) and it has spread. I love them. My thyme also came back. But my large rosemary bush did not make it back this year. I went to the Maryland Herb Festival yesterday and came home with a lot of herbs and flowers. Will be cleaning out and planting for a while. I love reading your blog and seeing the pictures. It’s like visiting a very good friend. I look forward in coming to this website on Sundays…very creative ideas. Your herb garden is really neat. 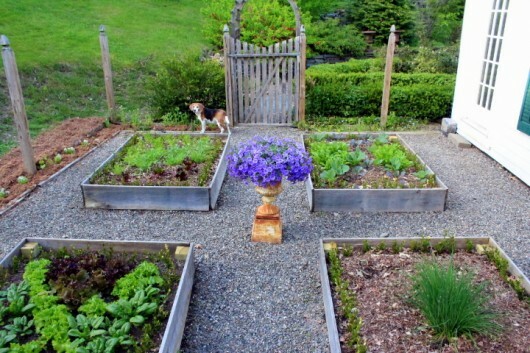 I liked how you planted the lettuce & spinach in a “design” fashion and having the boxwood cuttings around your beds. Inspiring and overwhelming all at once. I need a crew to help me! I wish I had put down newspaper before we mulched. There are so many weeds this year! I enjoyed the tour and also the special drink. Love your blog! I get my chips from local tree services. Just call and see if they have a list you can go on. Some ask for a modest charge to cover time and gas. ($20.00 is reasonable) My neighbor has started using the fancy cedar but it makes me sick when I smell it. I use to work in a cedar mill and it never made me sick, something is not right. From what I’ve read it shouldn’t be applied around foods crops or herbs because it inhibits growth. It looks like my garden is just about on the same time frame as yours and I’m in the Pacific Northwest. Can’t wait to try making your pie! I also use pre-soaked Tapioca to thicken my homemade jams! Enjoyed the tour, Kevin. I’m wondering where your fragrant herbs are? In another location? I have a small herb garden built-in to my back deck right up against the house. Go down three steps & you’re in the garden. Oregano, parsley, (2 kinds), basil, tarragon, mint……I’m always fighting weeds outside of the container boxes. I used your newspaper idea a week ago & it seems to be working wonderfully! …….Thanks for the tip! I retired last summer & discovered your website 2 weeks ago. I will be using lots of your ideas in the next weeks…months….years! Thanks for sharing so much with your many fans! Absolutely adore the calibrachea … is this an annual? Am using pots to plant my herbs in on my deck … easier to reach and no weeds … best for the lazy but loving gardener. Your bed designs are so gorgeous! Thank you, Kevin! My basil, parsley flat n curly for the butterflies, rosemary, marigolds, kale n lettuce are coming along nicely. Have to get some yellow cherry tomatoes plants n my little garden will be complete! 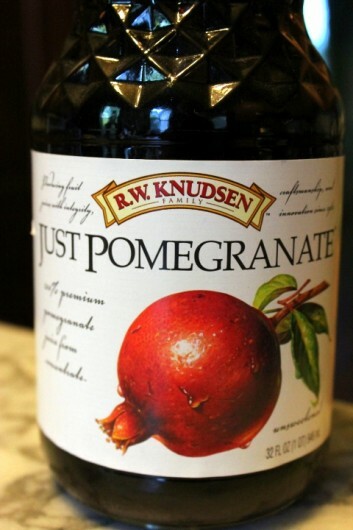 Ok I will have another drink, pomegranate is so healthy! Your blog is a pleasure to read, I look forward to it each week! Also, I am so confused about mulch after I googled it n saw what was at the big box store here in Allentown PA! Loved the tour. My neighbor was getting rid of a swing set. 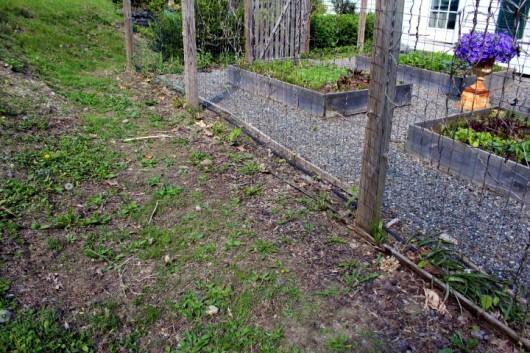 It is now in my yard and will be used to support the tomato plants. I will be able to cover it with screening to keep the squirrels out. They ate more tomatoes last year than we did. Always look forward to your post. “Home and Garden Inspiration”, yes indeed! Such a pleasure to tour with you and Lily. I so agree with the red mulch — uggghhhh! 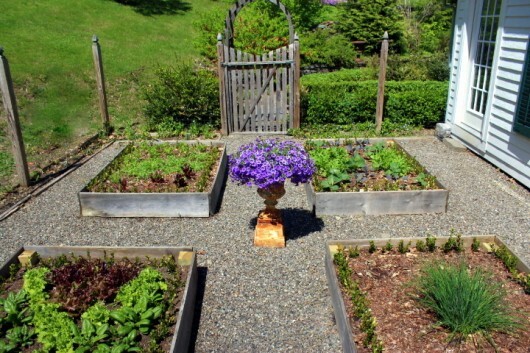 Your herb garden is fabulous. Herbs tend to be a bit wild and zealous in their growth. Your four-square makes them all look good. 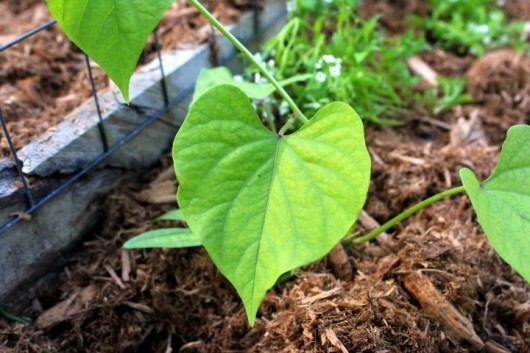 As pretty as they are, I have vowed to never let another morning glory seedling creep up my fence. I cannot stand the process of removing the vines in the fall. For me, it’s beyond tedious. In my garden, I have been redoing the bed in front of the garden. Gone are the ornamental grasses and beauty berries. Both are at their best in fall. I wanted something for the whole season as well as more herbs! After much back-breaking work, I’ve added hyssop, golden marjoram, kent oregano, cone flower, salad burnet, horehound, lavender, chamomile, and thyme. They’ll keep good company with the other deer resistant occupants: lemon balm, catmint, chives, lamb’s ear, sage, bee balm, wild marjoram and yarrow. I love this so much. Would love to do the four-bed plot. We only have a little two-bed one. This is something to think about for next year (or this year, depending on the amount of ambition I can scrounge up). And I LOVE your center urn. What a great idea! Thanks for sharing! I love the asthetics of your garden. My 3 garden plots are just production gardens set up to turn out the most fruit and vegetables- but I love the design elements. Maybe next year I will do a terraced flower garden between my deck and the lake. 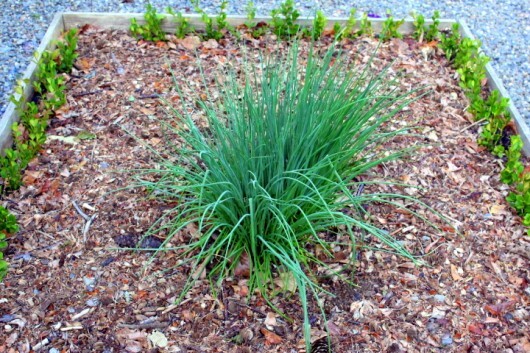 I doesn’t seem to matter how much pine straw/leaf mulch I put out in some of the sunny beds; I still grow lots of weeds. Have yet to set out my first time grown milk jug plants. How in the world to not lose all the babies as weeds??! Finally have my first planting of Amaryllis seeds this year coming up; seemed to take a little longer this year. Sadly, I lost my first growing of around 200 of them that were 2 year old ones this past winter. Should have set them out instead of left in pots, since my 15+ year old ones survived in the ground. Found a new GA native plant in our woods this year; the Fire Pinks .Guess I should try to have my beds more organized like you do, but my plantings always just seem to be randomly enjoyed. 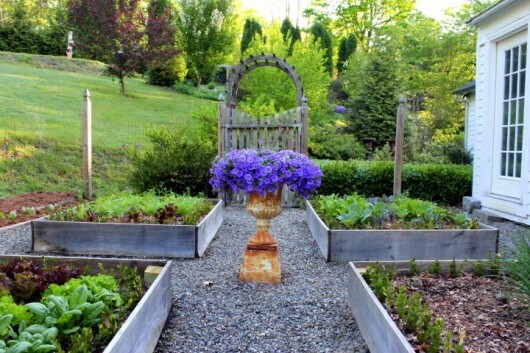 Love the kitchen garden, and had success, thanks to you, with using the newspaper under the mulch. Love the morning glories, and I interplant them with moonflowers so that day and evening there’s something blooming. I enjoy so much touring your garden….aw…but how I wishing can really walk through it and enjoy the drinks and munches as well…who knows…coming from the Philippines….not impossible! Thanks Kevin for sharing your world! Inspiring! Your herb garden is lovely! The Calibrachoa in the center is such a sweet and magnetic visual interest. And look how your plants are growing. Every gardener loves that sight very much, for sure. Great job! Preparing my gardens for planting. 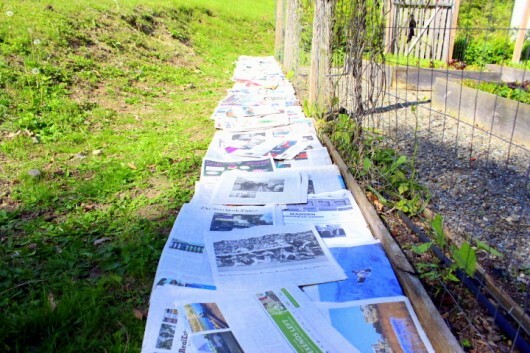 By the way you posting about putting newspaper down was a life changing for me when planing my garden…AWESOME! Thank you for all your tips, ideas and recipes. How do you dare plant so early? I live not too far from you, in the southern tier of NY, and we would not dare plant anything this early. One day I hope to be as organized a gardener as you. I see some shade over your beds. I was wondering if they get morning sun only? gets about 4 hours of direct sun. Everything I’ve read says it needs 6 hours. What do you think? Hi Tara – Some plants prefer only the morning sun that an eastern exposure provides. My herb garden is located on west side of the house, and receives about 8-9 hours of direct sun each day.